One of the questions I am most frequently asked is how much fruit to use with a certain amount of water, especially if the container size is different from what is listed in the recipe. My answer: use as much fruit as you would like and don’t worry too much about ratios. Making infused waters is liking making a vegetable stew; you are not going to ruin the stew if you an extra cup of peas, for instance. So, use your best judgement and err on the side of adding more fruit rather than less fruit. While I’ve tried my hardest to post recipes that have been refined through many attempts, the ingredients and their ratios are by no means set in stone. I urge you to experiment! Find the flavors that your tastebuds crave. –Citrus rinds. If you love lemon as much as I do, you might be tempted to throw in some extra lemons into your infused water. Go for it! But, be sure to remove the rind. Citrus rinds produce bitter flavors, so the more rind-on lemons you add, the more your risk an unpalatable result. –Herb combinations. If you use too much of a strong herb, such as rosemary, it can single handedly ruin an infused water by overpowering it with flavor. Also, many herbs do not combine with certain fruits. For instance, basil or mint with strawberries creates an infused water that taste like strawberry leaves. –Sweet fruits. It’s hard to go wrong with adding too many sweet fruits such as strawberries or pineapple. 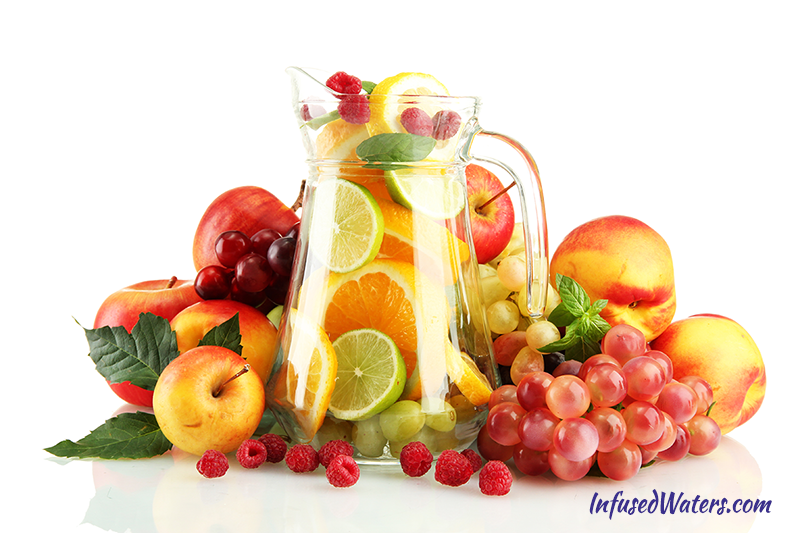 The worst result will be that you need to add ice or additional water to make your infused water less potent. Remember, we are “making soup” here and not baking, so don’t get too caught up in the details. Infused waters can take on many different flavors and potencies. The end goal is always your hydration and health. Please let me know if you have any questions and happy sipping! I love your information, found lots of combinations. Having a memorial Saturday and want to make flavored water. I use a lot of Essential oils doterra. essential oils and the peppermint one drop is equal to 40 cups of peppermint tea. I am thinking about orange and strawberry with 2 drops lime essential oil from what you have here on your tips maybe heavier on the strawberries, in a 1 1/2 . Trying to decide if raspberries would be better. Hi, Kim, and sorry for the late reply. DoTerra oils are, as you indicate, incredibly concentrated. I tend to stay away from them because I have never ingested essential oils; I’ve only applied them topically. If you do begin making waters with essential oils, I would fill a few regular glasses with water and do experiments with the oils/flavors. If you find a good flavor combo, you can always dilute with water until you find the right balance. That being said, I still recommend using natural sources whenever possible, especially with easily obtainable fruits such as lime. Peppermint is more difficult to come by than spearmint, but the flavor is very close. Keep us posted on your results! Hi, Kim. I’m sorry, do you mean the pictured pitcher? I suffer from acid reflux, is there an alternative to use instead of the lemon? Hi, Andree. Sorry to hear that. I’ve read that apples and melons (cantaloupe, watermelon) have low acidity and are fine for most people with acid reflux. Ginger and fennel are also soothing for digestion, so you may want to experiment with herbal infused waters. I have noticed that if not drinking fast enough it’s like fermentation is occurring. Is it because I’m using to much fruit? Mind you my water sits maybe 3 days when thus happens. I use about a two gallon jug is that to much? That is a great question. Its the same one I have. very good article, i will be sure to follow it! All your recipes look delicious! I’m just being introduced to Infused waters, n I’m in love with all the combos u can make. Right now, I’m using the Grapefruit lemon lime cucumber, n mint infused water, n it’s awesome!. I have a 32 oz bottle that I use, I just use 3 -4 slices of each fruit, n about 2-3 mint leaves. If I’m using a 1 gallon container of water, how many lemon, lime, and oranges would you recommend I use? Do you throw the fruit away the water has Is gone ? I’m new to this, and been doing lemon and lime water. I want to do apple but how? I also been doing cucumbers.